Friday we kicked off our beer consumption by visiting Thimble Island Brewery, which is a new, local Brewery. I enjoyed their Double IPA the best. mmm. Our evening concluded by spending some time with our neighbors, eating dinner, throwing back some cold ones and chillin’! Woke up to a rough Saturday morning – took some Motrin, ate a hearty Egg White Omelet with all the fixin’s and got ready to hit the gym. 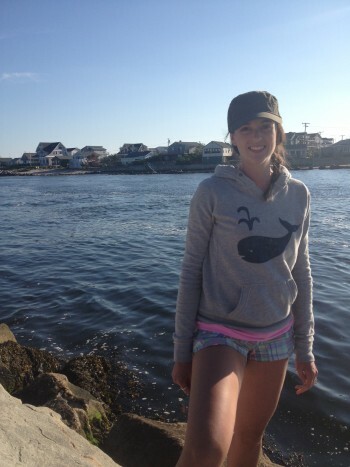 I had made plans to workout with a friend of mine (my college roommate – yay! 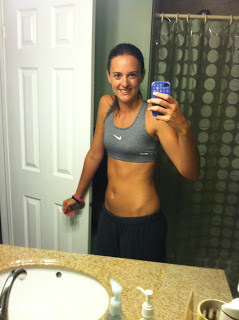 ), so this helped motivate me to not be a bum all day in my sweats – as hard as that was. We went to her local gym and had a bomb workout. It’s the days you don’t want to do anything which turn out to be the best ones. It was a really fun time and good to get some new workouts to change things up in my routine – I definitely feel some sore muscles today! Weekends are much more difficult to focus on our healthy eating. Being home, having (sometimes) not so good food around, not being on a schedule makes you go to the chips and cookies more often than you would during the week. This is why my meal plan made ahead keeps us on track. There was no guessing, or figuring out what to eat….as much as we wanted to go out to dinner we knew that wasn’t the best option. 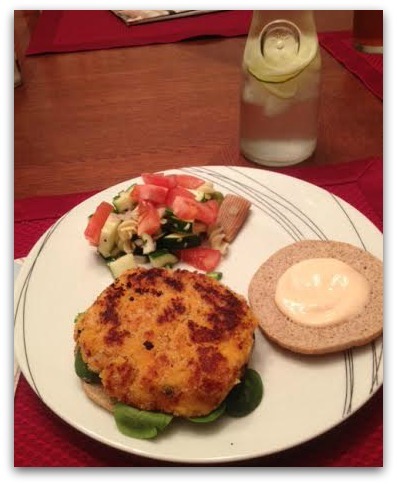 One of our newer, favorite go-to meals are Sweet Potato Burgers. SO yummy! It’s really a small amount of Sweet Potato mashed with Cannelloni Beans and a few other goodies. 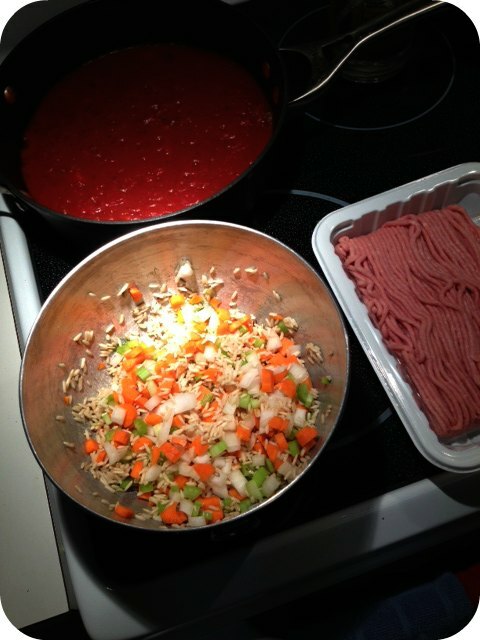 We top it with a secret topping which we call “fancy sauce”. It originally started with Mayo/Sriracha/Cayenne Pepper. However, we all know Mayonnaise is pretty high on that calorie scale – as delicious as it is, so we have been playing around with different things and it has evolved into the healthier option which is Plain Greek Yogurt, Sriracha, Cayenne (optional) and Vinegar (optional). It’s just so tasty and contains protein! Win Win. Which brings us into Sunday – the day of REST! We started the morning off with an Egg White/Avocado Quesadilla with a sidecar of Strawberries. * Side note – has anyone done Peapod? We did this for the first time, I find that the fruit is fresher than the store! Back to life. The rest of the day has and will be spent cleaning, cooking and watching the AFC – GO PATRIOTS! And indulging in Meatball Subs. This entry was posted in Uncategorized on January 19, 2014 by Danielle Laroche. Gosh what a busy week! I have officially kick started my fitness and have gotten myself to the gym/yoga class for three days in a row, today makes four! BOO-YA! I feel good, can’t complain too much (I guess). I want to push myself and get back to being in shape and feeling good about how I look which will entail some tightening and toning – never been one to care about what the scale read. Monday – (is it sad I don’t even remember what I did on Monday! Am I getting THAT old already? Gosh). Monday I started in high gear = This is what we call Beast Mode (or maybe that’s just me!). There is my quick rundown of kind of a typical gym routine. I do a quick cardio and head right into strength training – unless it’s a cardio day in which case I will spend more time getting sweaty! Tuesday – I worked out with a friend on Tuesday and it was chest and back day. I can list my workouts if anyone wants them, but for now I’ll just add some here and there. We did mostly free weight training. Dumb bell bench press, incline bench press, front raises, side raises, pushups 3 ways and finished with some tricep work (my favorite)! Wednesday – Totally changing it up for the next few months, my friend and I signed up for “Hip Hip Hooray” Yoga classes. A friend of mine saw a class being offered to help with hip strength and flexibility, and with my recent surgeries she thought it might be something I would be interested in! We had our first class last night and I am already enjoying it! I am definitely sore today, moving and holding poses I normally would never have done before. I am looking forward to the 8 week result and having more rotation in my hip sockets! 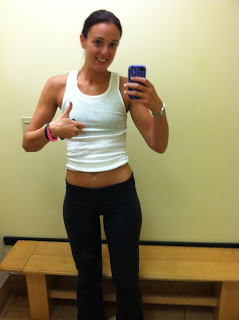 Thursday – I like to plan my workout ahead of time so when I get to the gym I’m not standing around like a weirdo! However, I am going in about 30 minutes and I have no clue what I want to do! 🙁 I think I will do some HIIT exercises, or something not using a machine. This will include: deadlifts, kickbacks, donkey kicks, extended donkey kicks, squats and lunges to name a few. I’m going to be feel good tomorrow! Friday – I plan on going to the gym Friday, but ya never know how things will change! I would be doing cardio and arms on Friday as I haven’t done those yet this week. I alternate between two gyms and I like each one for different reasons! Saturday – 6 days in a ROW! YIPPIE! Saturday I am going to the gym with another friend of mine! I do enjoy working out with someone, usually someone with similar goals as you can really push yourself! The other great thing with a workout buddy is getting to swap exercises, moves, ideas; I really do enjoy this. Some people can’t workout with someone – personally, I enjoy it most of the time. Sunday – This girl needs a REST! 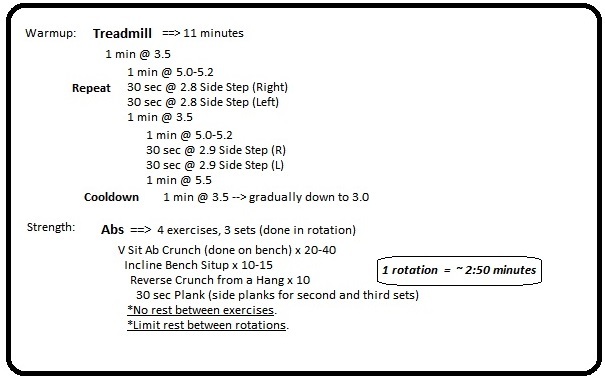 Hope you enjoyed my quick synopses of a workout week, if you have questions or want more just let me know. You CAN do it! It’s hard work. It’s drive. With determination you can do anything. This entry was posted in Uncategorized on January 16, 2014 by Danielle Laroche. I don’t want to call this a resolution, but a couple things Kevin and I are really trying to focus on, is our meal planning and trying to have “Meatless Monday’s”. Aside from that, I am really trying to focus on my workouts and planning those out before I walk through the gym doors so I’m not wasting time wandering around or doing the same routine! Besides using meal planning to stay organized, I feel it also helps cut our grocery bill since I’m not reaching for extra food that, in reality, is going to go bad and be thrown out! I keep two binders. One large one which houses all of my recipes (tried and true as well as newbies) and another smaller binder with the recipes for the month or so. I try to group the recipes together with similar ingredients so I can buy in bulk for 1-2 weeks (such as a 5lb bag of carrots instead of 1lb). I then make a shopping list for the month (or however far ahead I have planned my meals) and I put each week on a separate list (repeating the same ingredients so I can check “stock” prior to each trip). I plan the meals on the Month layout and I plan my workouts on the Weekly layout. It just works for me to it keep both separate. Here are some of the items from this weeks Shopping Trip. 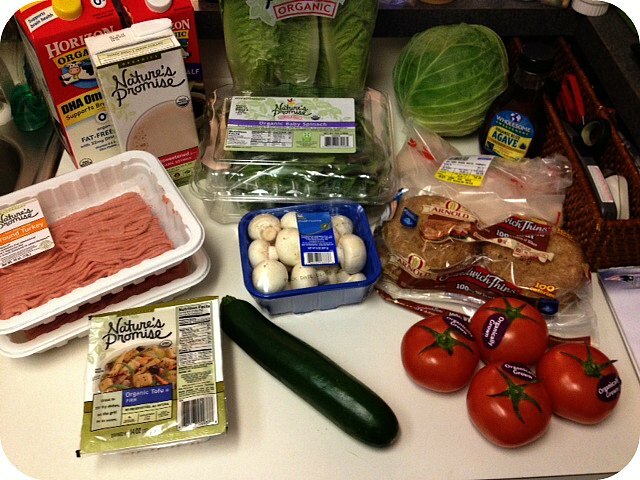 I’m prepping for Ground Turkey Stuffed Cabbage, Vegetarian Pot Pie (Meatless Monday) and Sweet Potato Burgers…I think Kevin’s Homemade Pizza is on the menu later in the week as well! I grocery shop Saturday mornings and usually do some meal prep Sunday morning. I’m an early riser so it helps to get things accomplished first thing and be able to enjoy the rest of the day. 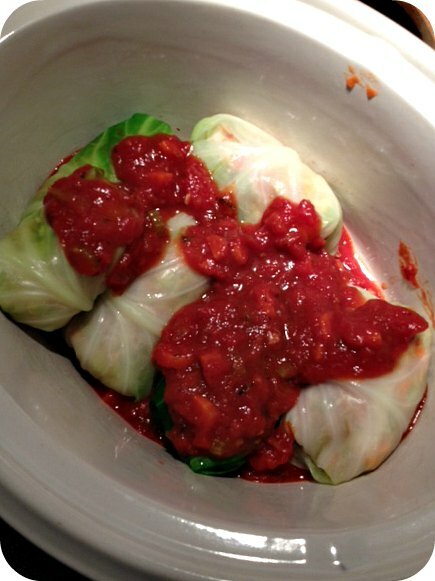 This morning I put together my Stuffed Cabbage with Homemade Sauce and threw it in the Crockpot – My FAVORITE kind of meal. 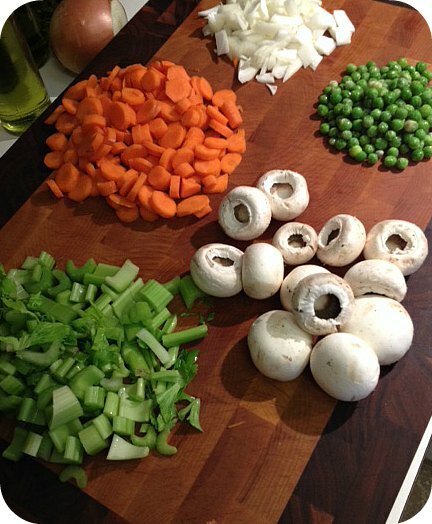 Since the trifecta – onions, carrots, celery – are in both today’s meal and tomorrow’s, I prepped veggies for the Pot Pie at the same time so while I’m getting my Workout ON, Kev will have quick meal prep after work. This is week two of meal planning and prep and so far it has been SO easy for the work week and no guessing in the morning of what we’re going to have for dinner. Kevin is GREAT in the kitchen (we usually fight about who’s going to cook – #firstworldprobs). But as long as I get the organization and everything laid out, he’s ready to rock & roll and I love that! Whoever cooks, the other cleans up and we both prepare lunch for the following day which can be anything from soup, salad, leftovers, sandwiches…it’s constantly changing. This seems to be working for us! What are some of your meal prep, tried and true, planning techniques? This entry was posted in Uncategorized on January 12, 2014 by Danielle Laroche. Seeing as we’re already a week into 2014, I figured it would be a good time to share my January beauty favorites and some other things I am really loving for the start of the new year! Most of my items are things that I have been using for years and that work for me and my skin and others are new items I had been wanting to try and am totally obsessed with now! Disclaimer: It looks like I’m a Philosophy sales person but I promise I am in no way one of those. I just love their products and they are amazing for me and my skin. Hope in a Jar – I swear by this moisturizer. My Mom had a sample size jar a while back and she couldn’t stand the smell, so I tried it and it did wonders for my skin. I tend to get breakouts occasionally and this has minimized that a great deal and makes my skin so smooth. Hope in a Jar Night – So this is a new addition to my collection and when I first opened it I felt unsure. It’s VERY thick (hence it’s for nighttime) and creamy – compared to regular Hope. After I use my Clarisonic or Microdelivery, I need to give my skin extra moisture and boy does my face drink it up like water. I have been using it for about a month and I really am happy with it. Not sure if I would repurchase it – but it isn’t hurting me either. Purity & Purity Face Cloths – Purity has been my go-to along with Hope for quite a while now. It just works for me so I stick with it. I’ve never seen something just completely dissolve makeup right off of my face. It’s not harsh, doesn’t burn or irritate my skin or bother my eyes. The cloths I just started using. I will use a cloth to take most of my makeup and my eye makeup off before using my Clarisonic. Microdelivery – This has been another new addition for me. I have been using it since Christmas alternating with my Clarisonic. Love it. There are tiny beads in the gel that exfoliate the skin ever so gently. I like this to get off the dead skin that’s a little gentler than my Clarisonic. Favorites Kit – (no photo) This is just a small kit which has everything I mentioned for a great price! Small volumes in case you don’t like! Clarisonic – Since I’ve mentioned it a million times already, I am loving this thing. I’m not into their Customer Service, though. I was given this as a Birthday gift, which my Mom bought a few months ago, and it was defective right out of the package. I contacted Clarisonic directly and they basically told me I was out of luck! At least the department store took it back and said that batch was ALL defective. Unreal. Sigma Beauty F80 – Moving along to makeup, I asked for this brush for Christmas and I am IN LOVE. It’s a Flat Top Kabuki, about 6-7 inches long and it applies foundation amazingly well! Yoga Pant – I can never find workout pants that I love until I tried VS. The major winning factor for me is that they come in LONG! Being 5’8″ pushing 5’9″, it’s difficult to find pants that fit all over properly! These are long enough (they even come in Extra Long) and they are a little tighter stretch so all the fluff and jiggle stays put. Infuser Water Bottle – I mentioned this a few posts ago, this isn’t the infuser I own but anything along the same lines would do the job! Someecards Desk Calendar – Since I am obsessed with Pinterest, and these Someecards Meme’s, I asked for a 2014 desk calendar for Christmas so I could laugh my day away! 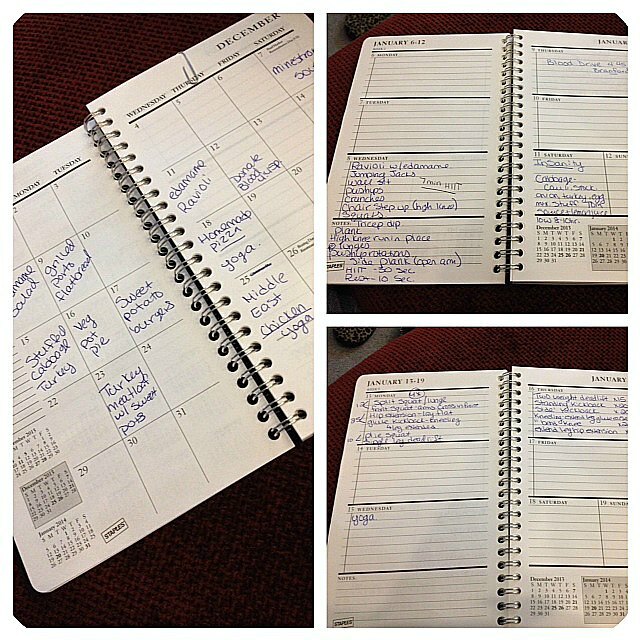 2014 Planner – Last but not least, a new planner! I didn’t buy this one, I just ran into Staples and wasted $17 on a boring planner, but they get the job done. Mostly, I wanted to use one for weekly/monthly meal planning. I have gotten off track the last few months with that and our grocery bills have gone through the roof. So by sticking to meals and a calendar, I find that we buy less! Anyway, I hope you all enjoy my New Year, New You, 2014 favorites and share some of your own! This entry was posted in Uncategorized on January 7, 2014 by Danielle Laroche.